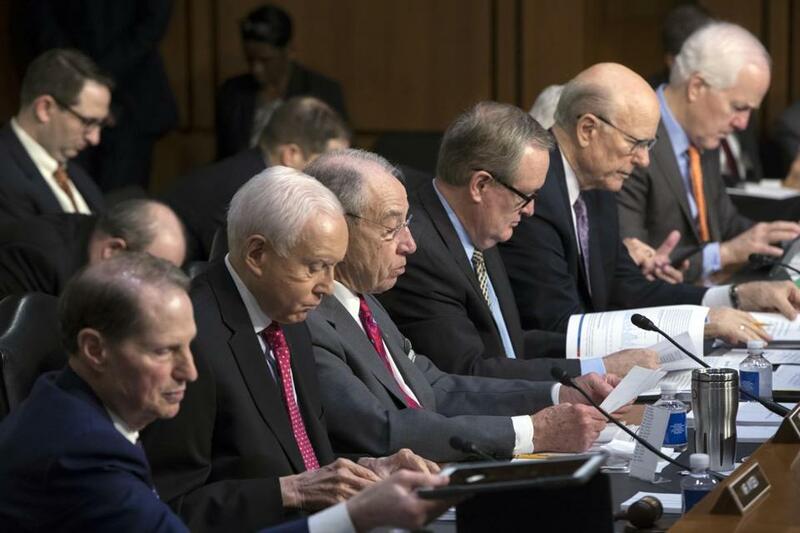 Members of the Senate Finance Committee worked on overhauling the nation&apos;s tax code on Capitol Hill on Monday. WASHINGTON — Senate Republicans said Tuesday they are intent on repealing the Obama health care law requirement that Americans get health insurance, targeting the provision as a way to pay for GOP legislation cutting corporate taxes and individual rates. The surprise renewal of the failed effort to repeal the law’s mandate came a day after President Donald Trump renewed pressure on GOP lawmakers to include the repeal in their tax overhaul legislation. The move by Republicans in the Senate Finance Committee also was dictated by the Republicans’ need to find revenue sources for the massive tax-cut bill that calls for steep reductions and elimination of some popular tax breaks. Targeting the mandate in the tax legislation would save an estimated $338 billion over a decade that could be used to help pay for the deep cuts. ‘‘We are optimistic that inserting the individual mandate repeal would be helpful; that’s obviously the view of the Senate Finance Committee Republicans,’’ Senate Majority Leader Mitch McConnell, R-Ky., told reporters. Without being forced to get coverage, fewer people would sign up for Medicaid or buy federally subsidized private insurance. The Congressional Budget Office has estimated repealing the requirement that people buy health coverage would mean 4 million additional uninsured people by 2019 and 13 million more by 2027. The House bill, which is expected to pass Thursday, does not currently include repeal of the mandate, which requires most people to buy insurance coverage or face a fine. Republican Sens. Rand Paul of Kentucky and Tom Cotton of Arkansas had pushed for the repeal in the tax bill, just months after GOP efforts to dismantle the 2010 health care law had collapsed in the Senate. ‘‘Repealing the mandate pays for more tax cuts for working families and protects them from being fined by the IRS for not being able to afford insurance that Obamacare made unaffordable in the first place,’’ Cotton said in a statement. Minority Democrats on the Finance panel exploded with anger when word came of the Republicans’ move. Congressional Republicans projected confidence earlier in the day about delivering the legislation, with Trump planning an in-person appeal to lawmakers ahead of a crucial House vote this week. ‘‘This bill will make things better for hard-working Americans,’’ House Speaker Paul Ryan, R-Wis., told reporters. House GOP leaders rallied support with the rank-and-file at a closed-door meeting. Underscoring the sharp political stakes for Trump, who lacks a major legislative achievement after nearly 10 months in office, is his planned meeting with House Republicans on Thursday ahead of an expected vote on the legislation. In its second day of work on the Senate version of legislation revamping the tax system. Minority Democrats on the panel complained that the bill would enable U.S. corporations with foreign operations and wealthy individuals and families to exploit loopholes to skirt millions in taxes. ‘‘It sure looks like a lot of gaming to me,’’ said Sen. Ron Wyden of Oregon, the committee’s senior Democrat. On Monday, a nonpartisan analysis of the Senate bill showed it actually would increase taxes for some 13.8 million moderate-income American households. Promoted as needed relief for the middle class, the House and Senate bills would deeply cut corporate taxes, double the standard deduction used by most Americans and limit or repeal completely the federal deduction for state and local property, income and sales taxes. Republican leaders in Congress view passage of the first major tax revamp in 30 years as imperative for the GOP to preserve its majorities in next year’s elections. Trump’s planned pitch on Capitol Hill, after returning from his Asia trip, was disclosed by a White House official who wasn’t authorized to discuss publicly the president’s schedule and spoke to The Associated Press on condition of anonymity. In the meantime, Trump tweeted into the debate Monday by urging Republican leaders to get more aggressive in the tax legislation. He called for a steeper tax cut for wealthy Americans and the addition of a contentious health care change to the already complex mix.